86 M T D D e c e m b e r 2 0 1 8 F o c u s O n I n d u s t r y I n our November issue, Modern Tire Dealer ran a story on the rise of a new tire category: the rugged terrain, or R/T, tire. Not every tire company has an entry in that "hybrid" segment; however, it's not marketing hype. Many light truck tire manufacturers and marketers have confirmed consumers want a tire that fits in-between the A/T and M/T tire segments. 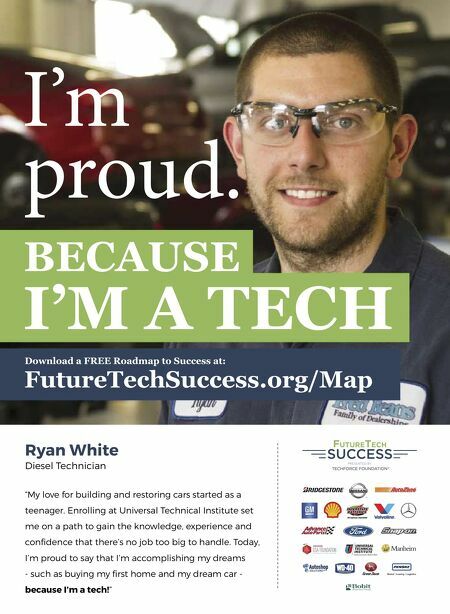 e trend began four years ago when Toyo Tire USA Corp. introduced the Open Country R/T. At the 2018 SEMA (Specialty Equipment Market Association) Show, two more tire companies introduced their versions. 2 R/T TIRES FROM SENTURY Sentury Tire USA Inc. is marketing two new R/T (rugged terrain) tires in 2019: the Delinte DX12 Bandit R/T and the Landsail CLX12 Rogueblazer R/T. Executive Vice President Max Wee said the market demanded it. "ere's a segment of the market that wants something a little more aggressive than the A/T, but does not want to go all out for the M/T." e noise and ride comfort levels for the company's R/T tires are less extreme than they are with traditional M/T tires, even in the 12-ply (Load Range F) sizes, said Wee. "For the late-model pickup trucks, you need an F-range tire to accommodate the load ratio and psi," added Sales Director Nick Gutierrez. e DX12 Bandit R/T is available in 17 sizes. Six are 12-ply sizes ranging from 33x12.50R20LT 123R to LT325/45R24 127/124S. e other 11 are 10-ply sizes ranging from LT285/75R16 126/123S to LT325/60R20 126/123S. e CLX12 Rogueblazer R/T is available in 19 sizes. Eight are 12-ply sizes ranging from 33x12.50R20 123R to LT325/45R24 127/124S. e other 11 are 10-ply Load Range E sizes ranging from LT285/75R16 126/123S to LT325/60R20 126/123S. In addition, the Rogueblazer R/T features a unique "double sidewall" design. Customers have the option of either the "R" (for Rough) design shape for a more dynamic and aggressive look, or the "T" (for Tough) shape for a more traditional appearance. Both tires are produced in ailand. ey also feature the 3-Peak Mountain Snowflake symbol. MILESTAR PATAGONIA X/T Some companies, like Atturo Tire Corp., refer to their hybrid tires with an "X" (for extreme) instead of an "R." Tireco Inc. does the same thing with its Milestar Patagonia X/T. Andrew Hoit, vice president of sales and marketing, said the Patagonia X/T has the aggressive looks of a mud-terrain tire but the road manners of an all-terrain tire. It is designed for vehicle owners who spend 90-plus percent of their time on the road, but want the look of an off-road tire. e Patagonia X/T will be available in 20 sizes. "We're definitely differentiating ourselves by the size lineup," said Hoit. "It'll be from 33-inch overall diameter all the way up to 40-inch overall diameter. e new trucks are coming with such large wheel wells that it's extremely easy to put 38- and 40-inch tires under them." Tireco is the first manufacturer with a 40-inch size (40x13.50R17LT) in this segment, he said. e 40-inch, Load Range C size will be available in 2019, along with a 37x12.50R20, Load Range F size. 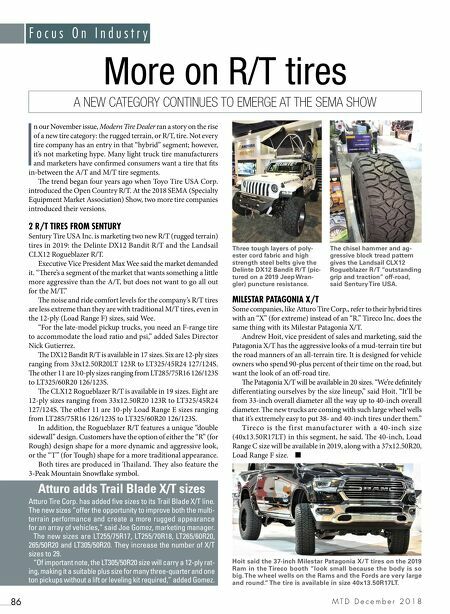 ■ More on R/T tires A NEW CATEGORY CONTINUES TO EMERGE AT THE SEMA SHOW Atturo adds Trail Blade X/T sizes Atturo Tire Corp. has added five sizes to its Trail Blade X/T line. The new sizes "offer the opportunity to improve both the multi- terrain performance and create a more rugged appearance for an array of vehicles," said Joe Gomez, marketing manager. The new sizes are LT255/75R17, LT255/70R18, LT265/60R20, 265/50R20 and LT305/50R20. They increase the number of X/T sizes to 29. "Of important note, the LT305/50R20 size will carry a 12-ply rat- ing, making it a suitable plus size for many three-quarter and one ton pickups without a lift or leveling kit required," added Gomez. Three tough layers of poly- ester cord fabric and high strength steel belts give the Delinte DX12 Bandit R/T (pic- tured on a 2019 Jeep Wran- gler) puncture resistance. Hoit said the 37-inch Milestar Patagonia X/T tires on the 2019 Ram in the Tireco booth "look small because the body is so big. The wheel wells on the Rams and the Fords are very large and round." The tire is available in size 40x13.50R17LT. The chisel hammer and ag- gressive block tread pattern gives the Landsail CLX12 Rogueblazer R/T "outstanding grip and traction" off-road, said Sentury Tire USA.